Coastal Management Specialists use science, economics, and policy to study the physical nature, dynamics, and potential change of marine ecosystems, the impact of humans on them, and the techniques necessary to manage the marine environment. Their efforts help balance societal and economic needs with the ability of the natural environment and ecosystems to support those needs. The work of a marine resource manager constantly moves between the worlds of marine science and marine policy. Often times work in this field involves working collaboratively with many different types of groups such as fishermen, researchers, policy makers and coastal residents. Individuals in this field often have broad, interdisciplinary science backgrounds and may be employed by private industries, academic institutions, government agencies, and regulatory bodies. They work as researchers, monitors, analysts, and managers of marine resources. Marine or coastal resource managers are federal or state regulators that create, implement and enforce policies related to the ocean or the coast. Resource managers may have jurisdiction over or be in charge of a particular species or group of species (such as fish, marine mammals) or a particular area such as state beaches or marine protected areas. Collect and evaluate environmental data to assess the overall status of resources. Collect and analyze available economic and social data to develop policy recommendations. Review and use supporting management tools such as zoning, permits, mapping, and impact assessments to manage resources. Monitor and enforce compliance with resource usage regulations and laws. Confer with scientists, engineers, regulators, and others, to plan and review projects, and to provide technical assistance. Advise stakeholders on applicable laws and regulations. Coastal/marine resource management is interdisciplinary, and thus, individuals in this field have a broad-based knowledge background in both physical and social sciences. Design and develop tools and techniques to assist in marine resource/coastal management. Ability to mediate or help foster common ground between groups of people who may have differing opinions on a topic. Many marine resource managers work with environmental protection agencies overseeing the impact of development on the marine environment and formulating procedures for minimizing this impact. There is a need to increase understanding the degree to which anthropogenic activities may be changing the underwater soundscape, how these changes may potentially impact marine animals, and what action can be taken to mitigate these potential impacts. In accordance with the Marine Mammal Protection Act (MMPA), marine mammals cannot be hunted, harassed, captured, or killed. Individuals must apply for a permit in order to conduct research and/or other activities that may impact marine mammals. Incidental Harassment Authorizations (IHAs) or Letters of Authorization (LOA) may be issued to groups incidentally “taking” small numbers of marine mammals and/or casing a “negligible impact”. Most IHAs and LOAs have involved the incidental harassment of marine mammals by noise (airguns, ships and aircraft, high energy sonars, and explosive detonations). The National Oceanic and Atmospheric Administration (NOAA) is developing science-based acoustic guidelines for assessing the effects of anthropogenic sound on marine mammals. This will help guide the permit process. Draft guidelines are also being considered by the International Maritime Organization (IMO) to reduce underwater noise from commercial ships, giving special consideration to propulsion, hull design, onboard machinery, and operational modifications. Acoustic devices can be used to reduce risk and decrease potential human impacts on marine animals. For example, passive listening systems called Marine Autonomous Recording Units (MARUs), or “pop-up” buoys, have been deployed along the Atlantic coast to continuously monitor for the presence of cetacean species such as the critically endangered North Atlantic right whale. Scientists are gathering acoustic data on the seasonal occurrence and distribution of endangered right whales in coastal waters to reduce the risk of ship strike. Regulations have been passed to implement speed restrictions in specific locations along the U.S. east coast, and shipping lanes have been shifted to reduce the risk of collision between large ships and whales. Real-time automatic-detection buoys are an acoustic tool used to monitor right whales off the coast of Massachusetts. Ten auto-detection buoys have been deployed between the Port of Boston’s inbound and outbound shipping lanes. The buoys can detect right whale vocalizations within 5 nautical miles, and information on which buoys detect whale vocalizations are re-transmitted to vessels. Captains, other mariners, and the general public can also access the real-time information from the “Right Whale Listening Network” . Time from detection at the buoy to posting on the website can be as short as 20 minutes. 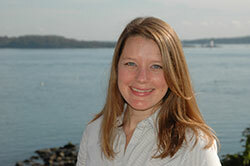 Michelle Carnevale is a coastal management specialist with Rhode Island Sea Grant and the University of Rhode Island Coastal Resources Center (CRC). Carnevale has worked at RI Sea Grant/CRC since 2009 conducting research and outreach relating to coastal management and marine spatial planning, with an emphasis on offshore renewable energy and climate change adaptation. Specifically, her research has examined offshore renewable resources, technology, and the environmental effects of its development for the Rhode Island Ocean Special Area Management Plan (http://seagrant.gso.uri.edu/oceansamp), an ecosystem-based marine spatial planning project. In addition, Carnevale has been heavily involved in the creation of a regulatory framework for offshore renewable energy to be used at the state level in Rhode Island. Currently, Carnevale is managing a statewide project in Rhode Island looking at the potential risk posed by coastal erosion, storm surge and sea level rise and ways coastal communities can adapt to these changes. Carnevale joined RI Sea Grant/CRC after receiving a M.A. in Marine Affairs and a M.B.A. from the University of Rhode Island, where her graduate research focused on offshore renewable energy development in New England. She also holds a B.S. in Marine Ecology from Cornell University. Investigate Marine Mammals > How is sound used to protect marine mammals? Investigate Marine Mammals > How is sound used to study marine mammal distribution?